January employment gains significantly outpaced expectations, providing further evidence that the economy is on the mend. Hiring was broad-based, reinforcing the perception that the recovery is not reliant on a single sector, but the gains have yet to reach the levels necessary to significantly reduce the massive work force displacement created during the recession. As demonstrated last year, when first-quarter hiring got off to a good start, significant risks remain. Election year politics, the eurozone financial crisis and Middle East instability each have the potential to derail the positive hiring trend just as the debt ceiling debate and ensuing U.S. credit downgrade did last August. Still, the U.S. private sector has added jobs for 23 consecutive months, offering the promise of continued recovery momentum. Private employers added 257,000 workers in January with eight of 10 sectors reporting gains. Professional and business services, one of the primary office-using segments, led the way with the addition of 70,000 positions. Manufacturing was also a bright spot, adding 50,000 employees last month, with most of the gains tied to durable goods production. Leading manufacturing indices have steadily gained ground for the last three months, giving rise to hopes that this key sector finally has sufficient momentum to drive broader economic improvement. Government employment, however, continued to offset private job gains with a loss of 14,000 positions. Considering the severe governmental cutbacks of the last two years, it appears that the government is finally approaching its new equilibrium staffing levels. The unemployment rate fell 20 basis points to 8.3 percent in January, the lowest level in three years. However, some underlying trends paint a more complete picture of the amount of slack that persists in the labor market. The under-employment rate, which includes individuals actively seeking work and part-time workers searching for full-time positions, declined only 10 basis points to 15.1 percent in January. The rate has remained above 10 percent since mid-2008. Also, 1.1 million discouraged workers were counted last month, a gain of 114,000 from December. Expanding professional and business service payrolls offset the loss of 18,000 financial activities and information sector positions, yielding a net gain of 32,000 full-time office-using jobs. More than 184,000 full-time office using jobs were added over the past six months, contributing to a 10-basis-point drop in national office vacancy to 17.3 percent in the fourth quarter. 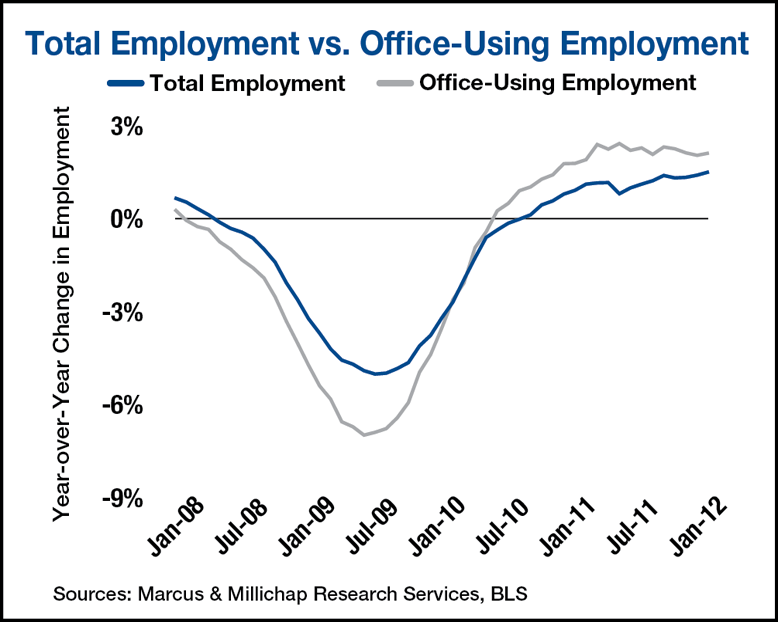 As office-using employers transition from backfilling empty cubicles to expanding space requirements during 2012, the vacancy rate will fall an additional 70 basis points to end the year at 16.6 percent. Job growth remains a significant driver in the creation of new rental households. The 1.8 million jobs created last year, together with other forces, sparked the absorption of more than 170,000 apartment units in 2011. As a result, vacancy fell 140-basis-points to 5.2 percent. This trend should continue this year, albeit at a slower pace, with vacancy forecast to decline an additional 40 basis points to 4.8 percent by year end. This prolonged strong demand, together with a limited development pipeline, will empower owners to generate 5.7 percent effective rent growth this year. This entry was written by marcusmillichap, posted on February 3, 2012 at 10:48 pm, filed under Research. Bookmark the permalink. Follow any comments here with the RSS feed for this post. Post a comment or leave a trackback: Trackback URL.